I recently had need to acquire two ¾" flexible compression pipes. I was in Smithfield and the thought of having to get in the car to go get them wasn’t very appealing. My usual port of call for such hardware requirements is to call into Lenehans on Capel Street. Unfortunately they only stocked ½" but they gave me the name of somewhere else I could try; Unit Supplies and Services, Dorset Street. I gave them a call and they had them in stock. I cycled along Dorset Street for the guts of a year on my way to work and I’d never noticed this shop. 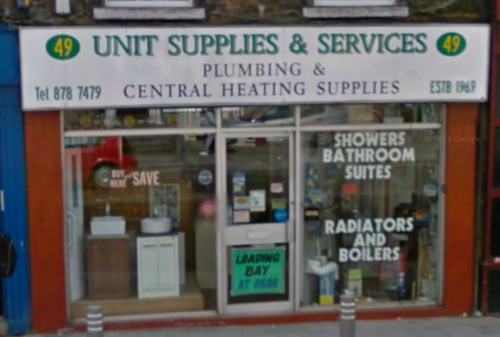 They have everything you could need plumbing wise, and the lads working in there are lovely gentlemen. After handing over the cash for the pipes (which were very reasonably priced), I thought I’d try my luck and see if they stocked the Triton T40i booster pump. I had tried three Triton stockists in Kilkenny, and none of them stocked it. One did say they could order it, the other two told me they don’t sell them. Unit had it in stock, so I decided to give these independent traders my business. It saddens me that shops like this are not the norm anymore. In Portlaw, where I grew up, we had a great hardware store, Phil Fogarty’s. You could get anything you needed in there (or so it seemed to a young me anyway). If a room was being repainted, we’d head down there, and Phil would mix the colour you needed. If you needed a handful of nails or screws, they’d be wrapped in newspaper for you. It’s a shame that the current crop of superstores like Woodies, B&Q, and Atlantic are making it so hard for small shops like this to survive. Here’s hoping that Lenehans and Unit Supplies and Services remain in business for a long time to come.